Our gut is home to 100 000 billion microbes that benefit us in many ways. Pioneering work in a new area of research, metagenomics, by Professor Jeffrey Gordon and his students is providing new views of the complex interrelationships between our varied diets, the structure and functions of our gut microbial communities, the nutritional value of the foods we eat, and our nutritional status. This new approach his work has implications for understanding obesity and under-nutrition. It will provide another paradigm to enhance the health of children and adults representing varied cultural traditions. Prof. Gordon and his lab are exploring a mysterious world, teaming with myriad life forms most previously unknown and unnamed. Collectively this universe of microorganisms is referred to as the gut microbiota and its collection of millions of microbial genes, as the gut microbiome. The goal of researchers is to gain new knowledge about how, beginning at birth, mutually beneficial relationships are forged between our gut microbes and ourselves and to use this knowledge to promote healthy growth in children, and to identify microbiome-based strategies for diagnosing, treating and ultimately preventing diseases related to poor nutritional status at various stages of life. “Human beings are supra-organisms, a multispecies compendium of human and microbial cells and genes,” notes Pr Jeffrey Gordon. Our gut microbiome endow us first with a number of genes that vastly exceed the number of genes in our human cells. Second the repertoire of our gut microbial genes endow us with physiological functions that our gut cells had not to evolve: for example the ability to metabolize some carbohydrates our gut cannot digest. 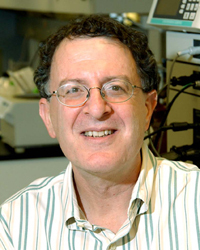 Jeffrey Gordon has revolutionized the way we look at the human gut microbiome and its role in human health. He and members of his lab have conducted pioneering interdisciplinary studies that ‘marry’ new methods in genomics with innovative animal models and studies of humans, including twins. decipher the genomic and metabolic features that monitor how the main groups of the human gut microbiota share nutrients in the gut. For this, he revisited the use of germfree mice: he recolonizing them with specific human gut microbes whose genome have been sequenced, and used sequential colonization, adding new microbes in the mouse models. provide new research tools for identifying how the microbiome may be used therapeutically. delineate features of the gut microbiome that are shared between individuals and those that vary from one individual to another. devise new approaches for defining the genetic factors that determine the abilities and functions of human gut microbes. Applications to human health are very large and the implications for global human health are great, especially at a time when the world’s population is increasing, as diets are changing as a result of Westernization, and where there is a pressing need to generate more and healthier foods. Discover online the Award ceremony lecture made by Pr. Jeffrey Gordon during the Asian Conference of Nutrition, in Singapore, in July 2011.